We’ve got a SWEET giveaway for you this week, Smarties, just in time for Easter. Meet Sarah, owner and baker at Sweetness Squared. She’s a stay at home mom to three kiddos. In August 2013 she and her husband were blessed with sweetness squared! Twins!! 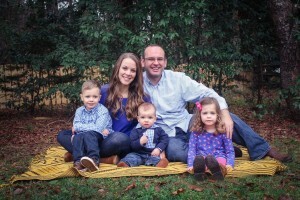 They went from being a small family of two and doubled into an active family of four. While she stays at home, she is pursuing one of her passions…baking. Cakes, cupcakes, cake pops, cookies – she custom makes it all from scratch in her home. And guess what, we’ve got a box of amazing, homemade cookies with your name written ALL over it (and go ahead, put your name on them before serving them to your mother-in-law at Easter brunch – we won’t say a THING! ;-)). 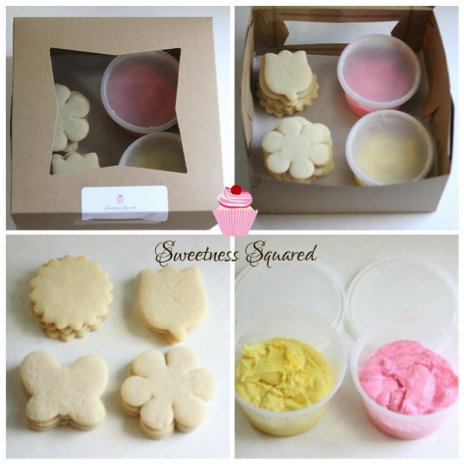 One luck Smarty wins a Sweetness Squared Cookie Decorating Box (value at $12.00 per box). The box will include one dozen cookie with 2 buttercream icings (all made from scratch). Winner can choose from 4 different cookie shapes: flowers, butterflies, bunnies or Easter eggs. Winner will be announced this Friday. Good luck, Smarties! Sweetness Squared will be taking orders until April 1st. To order, message Sweetness Squared shoot her a message on Facebook: https://www.facebook.com/sweetnessquaredbakery/ or send an email to sweetnesssquaredbakery@gmail.com. Orders will be ready for pick-up April 7th-14th. Hunting Easter eggs when young and now that older, hiding eggs for the young ones!! We love dying easter eggs. The annual neighborhood egg hunt! I liked you on Facebook as Heather Kelly. I liked Sweetness Squared on FB as Heather Kelly. Dying Easter Eggs, of course. Any chance they’ll ship to TN? I really like to come up with another way to “dye” the eggs, rather than the old fashioned way! All these years later, I still love dying Easter eggs! My favorite Easter activity/craft is decorating Easter eggs and the house for Easter. I like having all family here and watching the kids have fun. My favorite Easter time activity is VACATION! Every year since I was a kid we go to the zoo on Easter.my dad would take me as a kid and now he goes with me and my kids . Shared and liked both pages. We love “planting” jelly beans and watching lollipops pop up overnight! I like dying Easter Eggs and making Easter cookies with my granddaughter. My favorite thing about Easter is of course the reason for Easter and second watch my grandsons enjoy easteregg hunting…. I like CSP on FB as Sue Hull. I like Sweetness Squared on FB as Sue Hull. My favorite reason I love Easter is celebrating Jesus’ ressurection. I love being with all my family and watching my 2 1/2 yr old granddaughter look for eggs. We love using vegetable juices to dye our eggs!